Bisbal-Chinesta, J.F., Blain, H.-A. 2018. 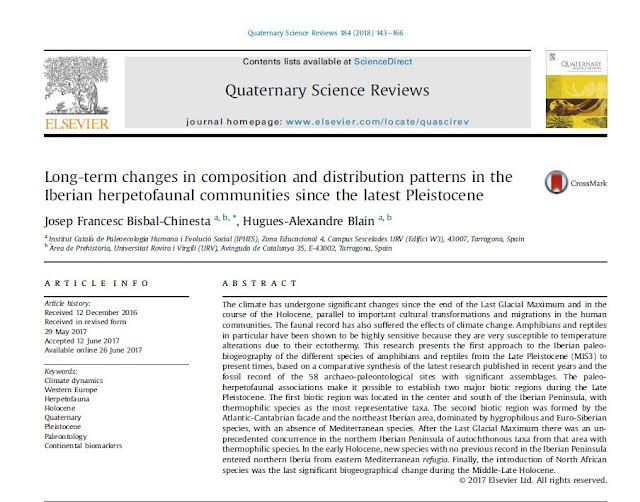 Long-term changes in composition and distribution patterns in the Iberian herpetofaunal communities since the latest Pleistocene. Quaternary Science Reviews, 184: 143-166. https://doi.org/10.1016/j.quascirev.2017.06.010. This research presents the first approach to the Iberian paleobiogeography of the different species of amphibians and reptiles from the Late Pleistocene (MIS 3) to present times, based on a comparative synthesis of the latest research published in recent years and the fossil record of the 58 archaeo-paleontological sites with significant assemblages. Leer más.